Oct. 13, 1990: EAC's second Hazardous Waste Day. Almost 2000 people take advantage of the eight depots around metro and in Halifax County. 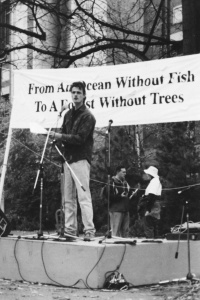 Dec. 1990: EAC, along with Greenpeace, the Cape Breton Coalition for Environmental Protection and the Save Boularderie Island Society, takes the federal government to court over the proposed Point Aconi Power Plant. Losing the case has a huge financial impact on the Centre (debt!) and morale takes a hit. Early to mid-'90s: EAC's Fundraising Committee puts enormous energy into restoring the Centre's fortunes, holding many functions. In '92, they hit the jackpot with the Stars Recycle Quilt, which raises over $15,000. 1992: EAC participates in the environmental assessment of a proposed sewage-treatment plant on McNab's Island, and is busy with the metro waste-management plan, especially as a critic of incineration. As metro gets serious about recycling, however, EAC gradually retires from the issue of garbage. The harbour, however, has been a periodic focus since early days. Nov. 1992: EAC holds its first sale of chemical-free Xmas trees, a tradition that continues. 1995: First Marine Issues Committee meeting. MIC has since tackled a huge range of issues affecting our oceans and coastal communities. EAC also sponsors an environmental audit of the G7 Economic Summit, held that year in Halifax. 1995: The N.S. Dept. of Natural Resources begins the long process of Integrated Resource Management (IRM), which seeks to classify all Crown land for either resource use or protection. EAC's Wilderness Committee becomes involved as the '90s progress. Feb. 1996: EAC is officially clear of the debt incurred by Point Aconi, but its membership base is lower than at almost any time in its history. 1996-97: Under pressure from mining interests, the John Savage government pulls Jim Campbells Barren in Cape Breton from a list of proposed wilderness areas. The WC is part of a massive lobby that successfully leads to the Barren being protected under law. 1997: EAC is an official intervener in the Sable Offshore Energy Project hearings, arguing against the project on both environmental and economic grounds. MIC launches the first of its many publications on marine issues; topics include deep-sea corals, discarding in the groundfishery, and marine invertebrates. December 1998: Welcome passage of Nova Scotia's Wilderness Areas Protection Act, which sets aside 31 wilderness areas, and the Endangered Species Act, both of which EAC strongly supports. Progress to implement these acts has been slow. Spring 1999: Founding of the New Vision for Public Lands Coalition, wherein the WC identifies over a dozen new proposed wilderness areas. 1999: Funding granted for TRAX, first project of the recently formed Transportation Issues Committee (TIC). The project's main aim is to reduce reliance on the auto in metro Halifax. 1999: Launch of Hemlock Circus, EAC's very own theatre troupe. Fun and education in one package! And we hold our first annual Garden Party and Auction, another tradition in the making.